Keto is one of the best ways to lose weight and get healthy. It’s attributed to everything from weight loss to curing MS and autism. Yet keto can also have some pretty intense side effects. What many people call the keto flu might start to set in within the first few hours to days. Headaches, muscle aches and nausea can all accompany this diet. The good thing is that’s how you know it’s working. One of the most unusual side effects can be bad breath. Your oral hygiene is perfectly fine, but you still find yourself getting strange looks from coworkers. You might even be able to notice the smell yourself. This side effect is caused by the excess influx of protein. When your body doesn’t get very many carbs it can’t use glucose as a form of energy. Instead, it turns to stored fat in your body for this energy. Your body starts releasing ketones when this energy is utilized. Unfortunately, ketones don’t have a great smell when they’re released from your body. Your bad breath is simply your body letting go of these excess ketones. Many people notice their bad breath goes away after a few weeks, but an unfortunate few never see a change. Find out what you can do to minimize bad breath and get back to your day-to-day life. Your bad breath may not be the result of bad oral hygiene, but it doesn’t hurt to brush up on your hygiene anyway. Try to keep your mouth as clean as possible. You don’t want mouth bacteria to worsen your ketosis breath. Brush your teeth twice a day minimum. Try to brush your teeth after every meal if possible. Invest in an electronic toothbrush to remove as much plaque from your mouth as possible. Floss twice a day and after every meal. Use mouth wash after brushing morning and night. You can remove even more plaque with a mouthwash that is specially formulated to fight plaque. Visit your dentist once a year. He may even have a few suggestions to help freshen your breath. Another cause of bad breath can be dehydration. You want to make sure that you are eliminating as many causes of bad breath, so your ketosis breath is the only source. Try to drink at least eight glasses of water every day. Also, when your body is going through ketosis it is releasing excess toxins. These toxins are usually released through your body’s pores and can also be released through your saliva glands. You want to ensure that you’re allowing your body to free itself of as many toxins as possible. If you don’t drink water, the toxins can sit in your mouth. Flush them by keeping hydrated. When you’re in ketosis, the last thing you want to do is increase your carb content. Ketosis is hard! Yet if you’re really bothered by bad breath, you might want to up your carb content a bit. Even if you simply up your carb content for a few days, you might be able to curb your bad breath. Try to aim for 65 to 75 grams of carbs per day to stop bad breath. This will probably knock you out of ketosis, but it will give you a break from the bad breath for a few days. 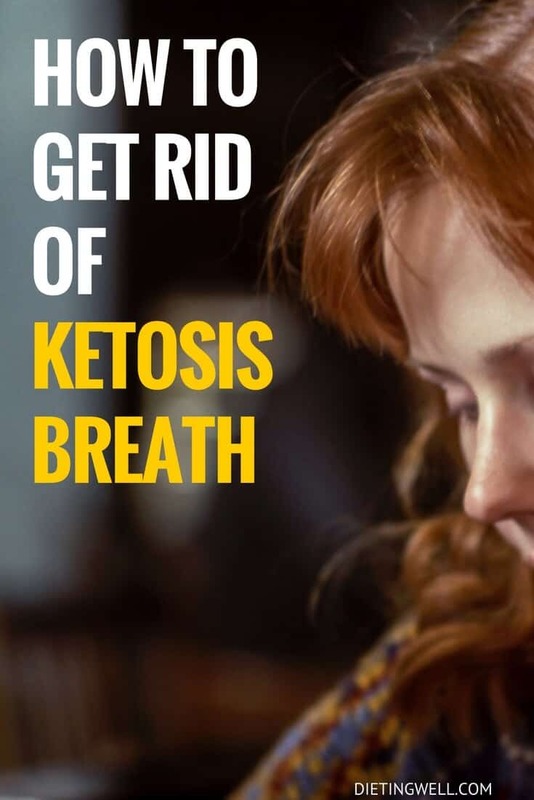 One of the most plausible ways to fix ketosis breath is to mask it. You might feel a little uncomfortable by simply masking your bad breath, but remember that your ketosis breath will not hang around forever. Masking your breath is a great way to get some daily relief while feeling confident in public again. One of the best ways to mask your breath is with an all-natural breath spray. Try to find a spray that doesn’t have any carbs in it; you don’t want the spray to knock you out of ketosis. Most breath sprays don’t have carbs because the amount of liquid sprayed in your mouth is so minimal. If you find that you’re overusing breath spray, you might want to switch to gum. Be careful with gum because it usually has carbs. Even sugar free gum can contain carbs, so make sure to check the label carefully. Many Keto blogs offer tips on which low-carb gums are the best. The best advice that you can get when it comes to keto breath is to wait out the suffering. You might not feel comfortable waiting out your keto breath, but luckily it will probably go away on its own in a few weeks. Most keto breath will disappear when your body readjusts to the amount of protein you’re ingesting. Simply use one of the tips to mask bad breath, and give your keto diet a few weeks before doing anything drastic. It’s not fun, but you’ll be happy when you come out on the other side without ruining your keto diet. If worst comes to worst, you might consider coming out of ketosis altogether. You might hate the idea of completely ruining your diet just because of bad breath; yet, many people won’t be able to continue with ketosis if they are experiencing such horrendous breath. You can always plan your ketosis breaks. This will help minimize some of the damage done by coming out of ketosis. Many people decide to come out of ketosis for vacations, holidays and special events. Try to plan your keto breaks to ensure you have some time to look forward to fresh breath. Try to use breath fresheners that are as natural as possible. Don’t use ones with harsh chemicals and abrasives as these can do further damage to your breath. Your body needs to stay balanced in order to naturally cleanse itself of bacteria. Some of the best cures for bad breath are parsley and mint. Simply take a few sprigs of these herbs to chew on throughout the day. There’s very few scents that parsley won’t mask. If you’re not fond of chewing on herbs throughout your day, try mint capsules. These are all-natural capsules that you can take in the morning that will release fresh scents throughout the day. If you want to stay fresh, you can always add oils to your toothpaste. Add a drop of tea tree oil to your toothpaste. You can even purchase toothpaste that has tea tree oils already in it. If normal hydration isn’t working for you, try a moisturizing mouth spray. These are specially formulated for people with bad breath problems due to dry mouth. Simply spray a few times in your mouth, and you should start to feel the results in a few hours to a day. Releasing ketones doesn’t necessarily mean you need to live with bad breath for the rest of your life. Try out a few of these tips to see which ones work well for your body. If worst comes to worst, you can always come out of ketosis for a few days to allow your body to readjust. I’m really surprised that a natural, internal deodorant was not mentioned. Taking chlorophyll capsules helps majorly neutralize strong body odors ranging from breath odors to b.o. Brand names such as Nullo are effective as well. Chlorophyll is a must if you have a tendency to b.o. or for anyone in ketosis emitting bad breath smells or pore smells.